MONTEREY COUNTY — Caltrans has received confirmation from National Weather Service (NOAA) data that a significant storm is in the forecast to begin in approximately the next 24-hours for the areas of Mud Creek (PM 8.9) and Paul’s Slide (PM 21.6) on State Route 1 in the Big Sur area. This advisory is to inform the public to be prepared for closure of the roadway tentatively scheduled for mid-day Monday, Jan. 14 due to a significant storm. Stand-by for additional information within the next 24 hours and a final notice will be sent when the roadway closes. Caltrans will have our Geotech, Maintenance and Construction units on call and prepared to inspect/clean up during daylight hours when the storm ends and it is safe to be onsite again. NOTE: These advisories apply only to the Mud Creek and Paul’s Slide areas with each closure being treated separately–both locations will close tentatively on mid-day Monday, Jan. 14. Please stand-by for additional information within the next 24 hours. 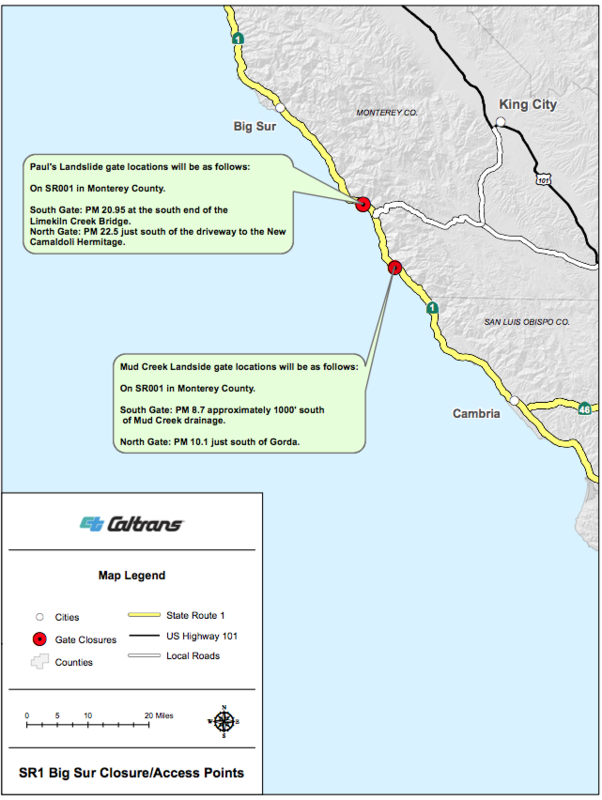 VIEW PDF OF HIGHWAY 1 GATE CLOSURES.